Intel's new developments haven't stopped for the 14.1 inch slim T-series. 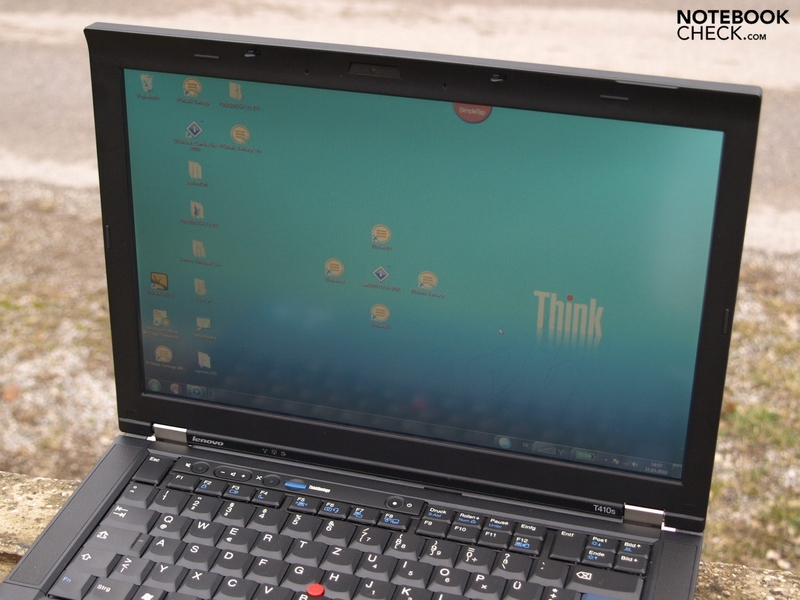 In addition some of the devices, such as the T410s we tested, have integrated a touchscreen and SSD. 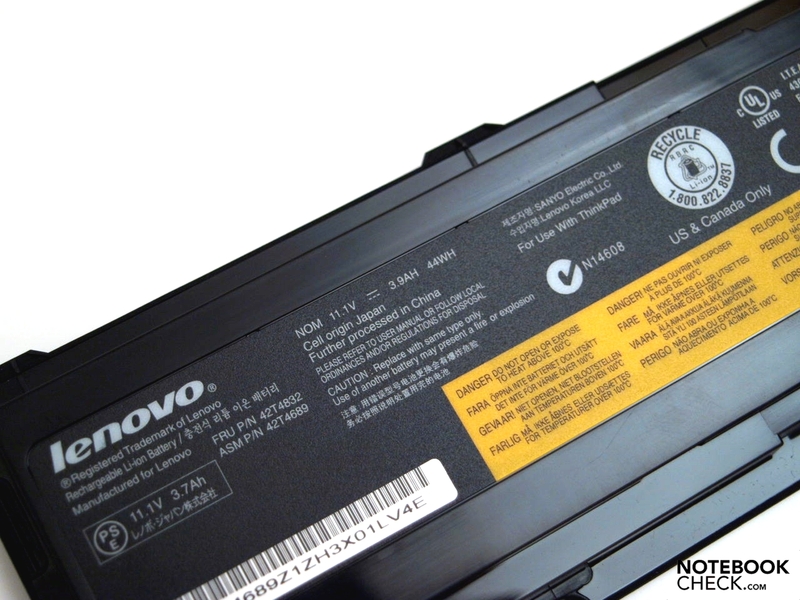 How well this business notebook by Lenovo completed our tests can be discovered here. 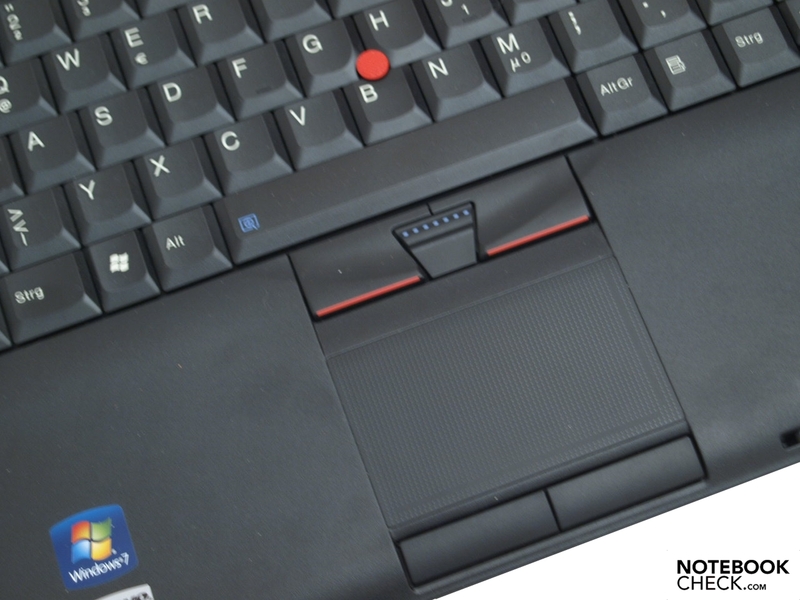 After having tested two other Arrandale models from the Thinkpad T-series, the T410 and the T510, we can now subject the T410s to our tests. According to the manufacturer, users can expect a good balance between mobility and performance with a T-series model. 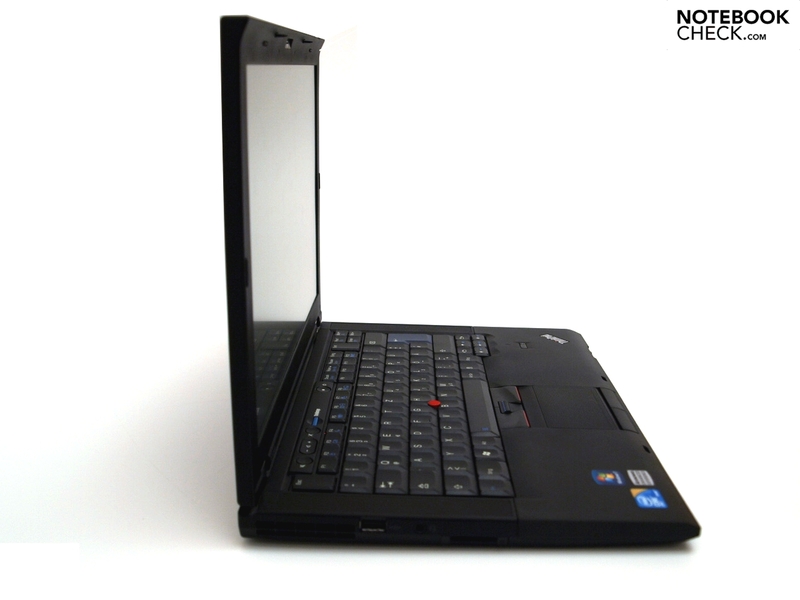 In addition the T410s places value in a light and slim design. There are numerous different models to choose from. For one it is possible to choose whether or not to have a touchscreen, whereby the display of our test device offers touch-functionality. For another the performance related components can be chosen from several available options. 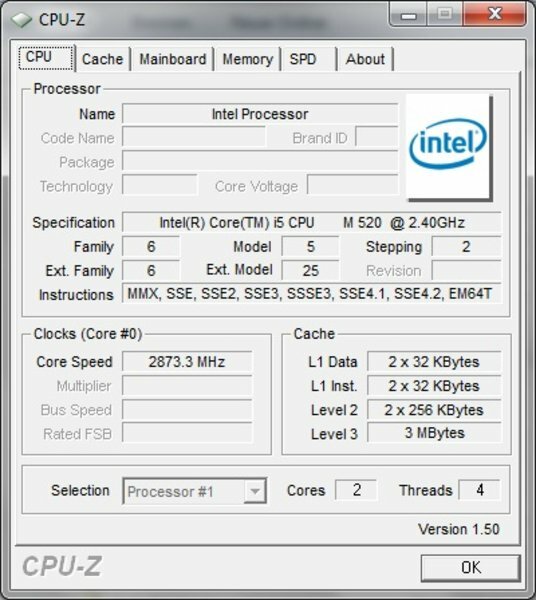 With respect to the processor for example a Core i5 520M, as in the tested device, or a stronger Core i5 540M. According to the manufacturers information, at least the top model should offer switchable graphics. With this it is possible to use the integrated GMA HD graphics chip, or the higher performance Nvidia NVS 3100M, depending on the mobility and performance requirements. 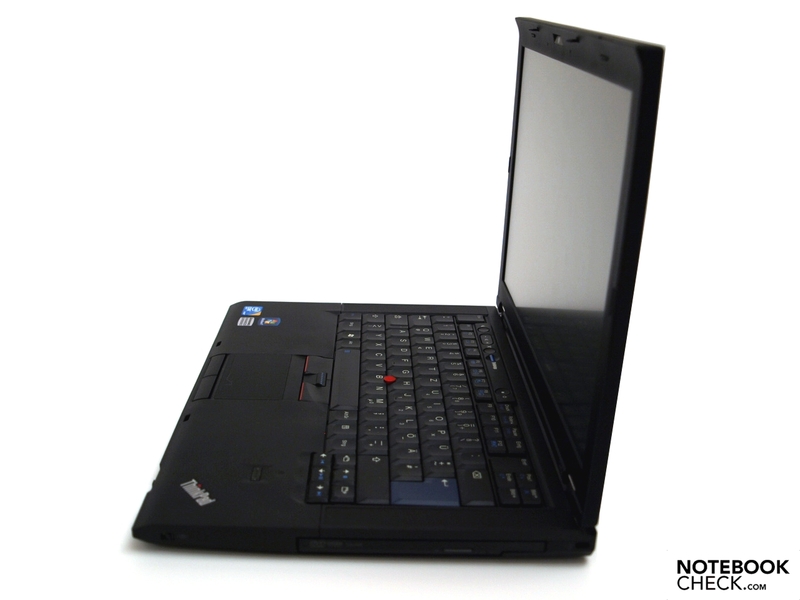 Interestingly the Lenovos US-Homepage doesn't currently list any T410s models with a discrete graphics card though. Our test model also had to make due with an integrated GMA HD graphics chip. As always battery life, performance and emissions are dependent on the integrated components. 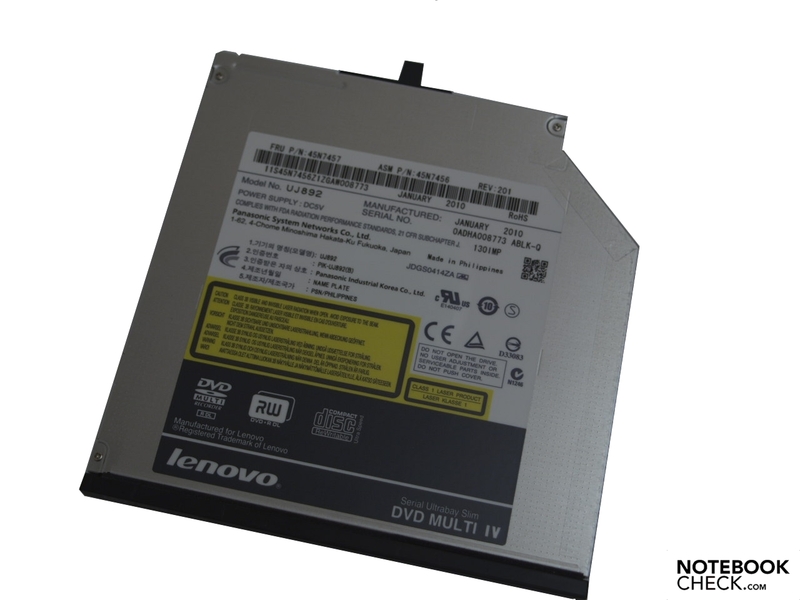 Our tested model was a T410s – 2912-3AG with SSD. Other models could lead to completely different characteristics in these areas. 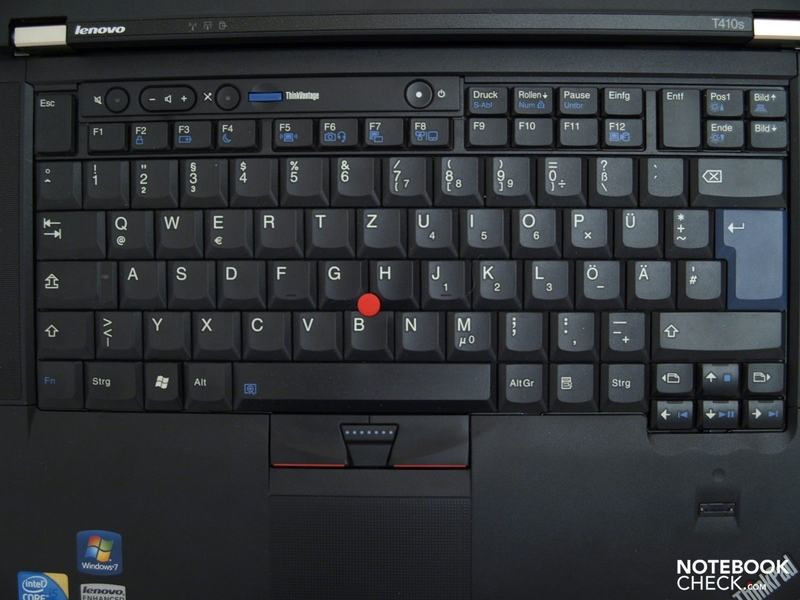 At first glance the Thinkpad is very similar to the already tested T410. Looking a little closer there are not only differences with respect to included interfaces though. It is also marginally lighter and thinner than its colleague, with a height of 33 millimeters, and a weight of about two kilograms. The total transport weight also includes the 340 grams for the power adapter. With regard to color options there is no difference compared to other current Thinkpads. 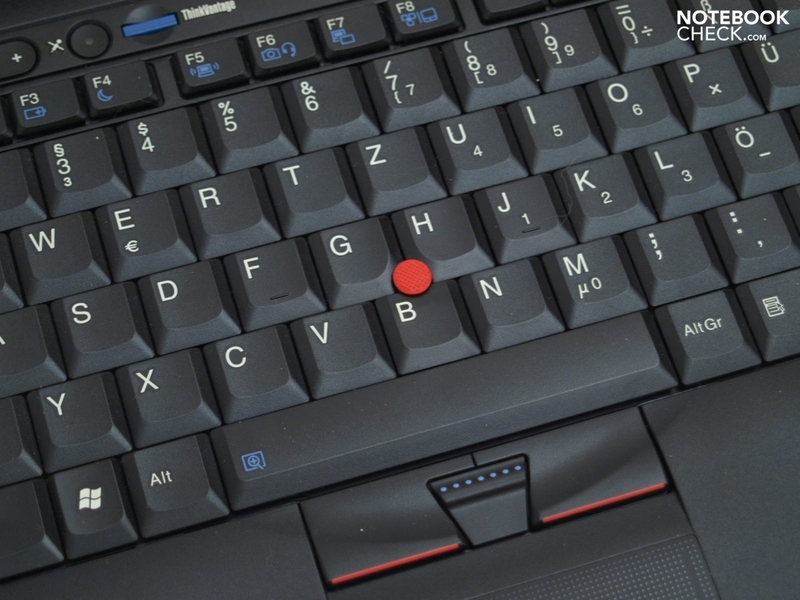 It is black with a red Trackpoint, blue entry key, and blue ThinkVantage button. The same applies to the good stability and warp resistance of the case and display. Only around the Ultra-Bay slot does the case give way a little when pressure is applied. The two metal hinges hold the display in place in every position, although they cannot completely prevent a mild wobble after adjusting the angle. On the other hand, the hinges are loose enough to allow opening and closing with a single hand. 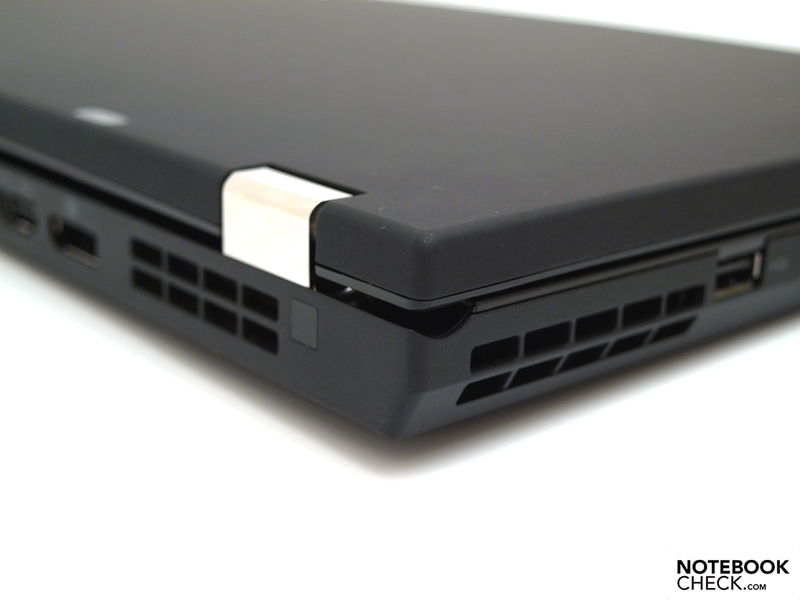 Two hooks hold the display lid securely closed when transporting the notebook. The release latch on the front edge of the base unit is easily operated, but makes a little noise. 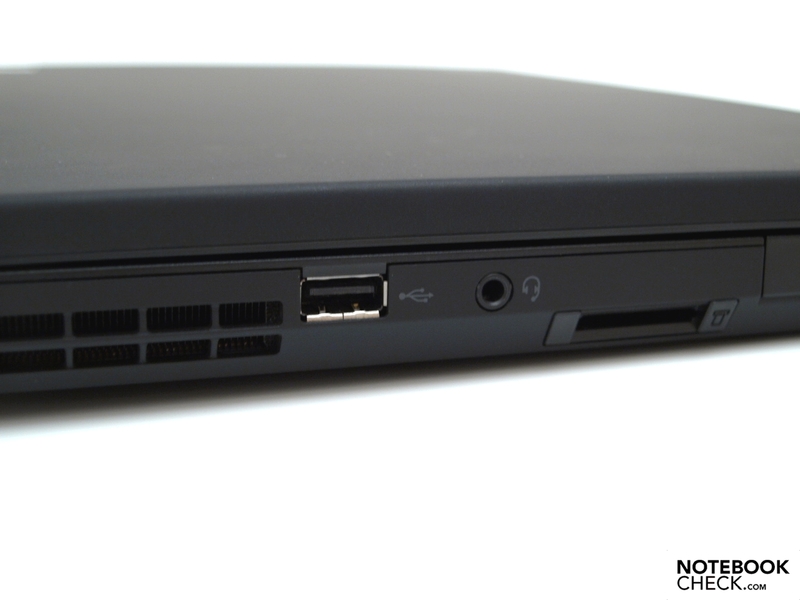 The Thinkpad T410s is substantially different from the T410 with respect to the interfaces provided. 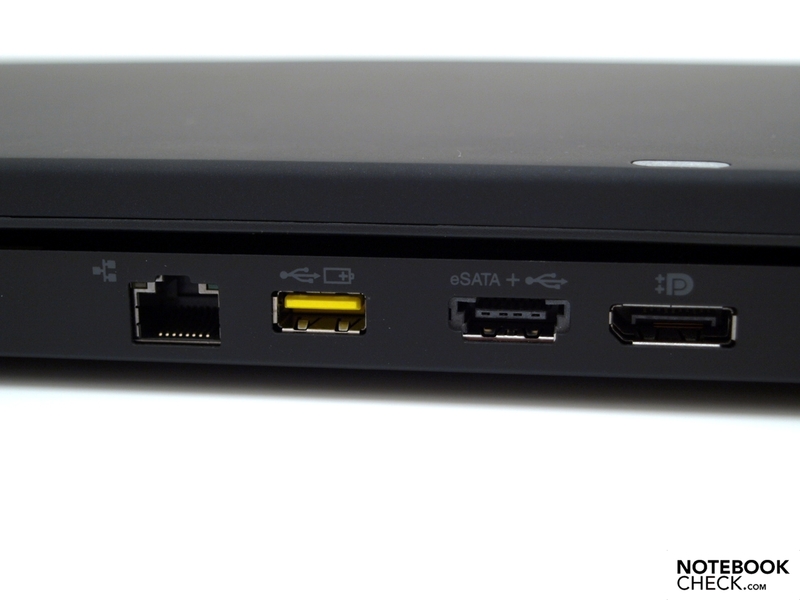 Altogether there are a total of 3 USB 2.0 ports, one of which is a powered USB port, and another which is a USB-eSATA combination. Next to VGA, there is also a digital DisplayPort to be found. HDMI on the other hand, over which picture as well as audio data can be transferred, is not available. The only audio interface, is a combination audio port for headsets. 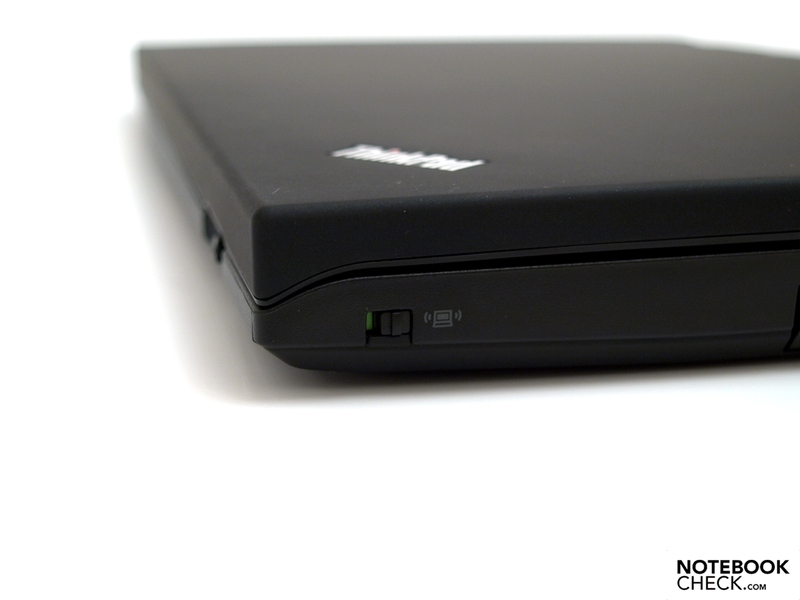 In return Lenovo has not forgotten an obligatory feature in business notebooks. Included is a Docking interface on the bottom. With this it is possible to easily use the notebook with existing work spaces, and also extend the available interfaces. An Intel 82577LM Gigabit network card is responsible for processing fast cabled Ethernet connections. 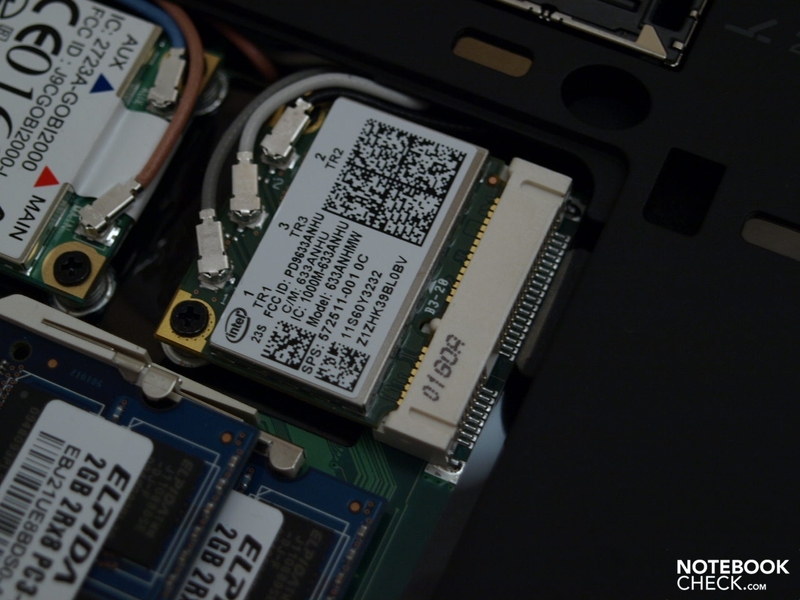 With the Centrino Ultimate-N 6300 AGN WLAN-module, also from Intel, network connections can be made over WiFi. In addition a Gobi 2000 HS-USB Mobile Broadband Device 9205 broadband modem by Quallcomm is integrated. Proviso for the use is a contract with a service provider. 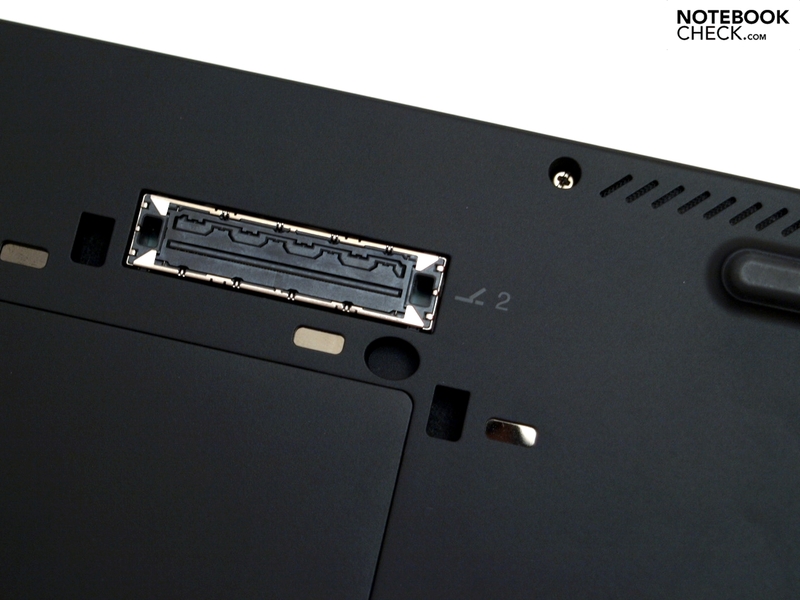 The SIM slot for this can be found, as usual, in the battery compartment. Although the RJ-11 port for a modem has been omitted, compared to the T410, the communications features can still be described as good. Complete with a 2 MP Webcam, allowing video conferencing with business partners. When it comes to communications features, there are several options, so that buyers should enquire about the details. Next to the usual Kensington Security Slot theft security, the T410s also has a finger print reader, and a TPM module integrated. Losses of data due to concussions of the mass storage device in the tested device don't need to be worried about: an SSD without mechanical components is used. Additionally the keyboard is water resistant against splashes of water. 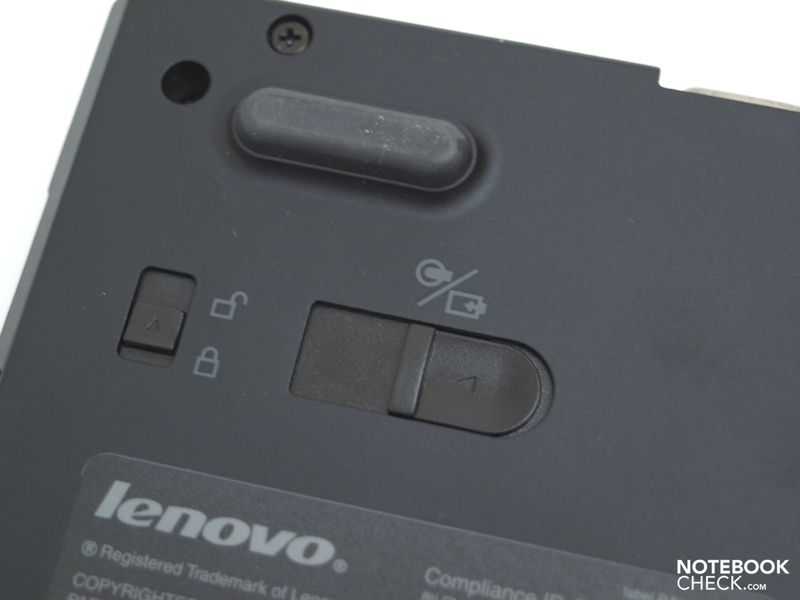 As usual Lenovo has been economical when it comes to accessories. 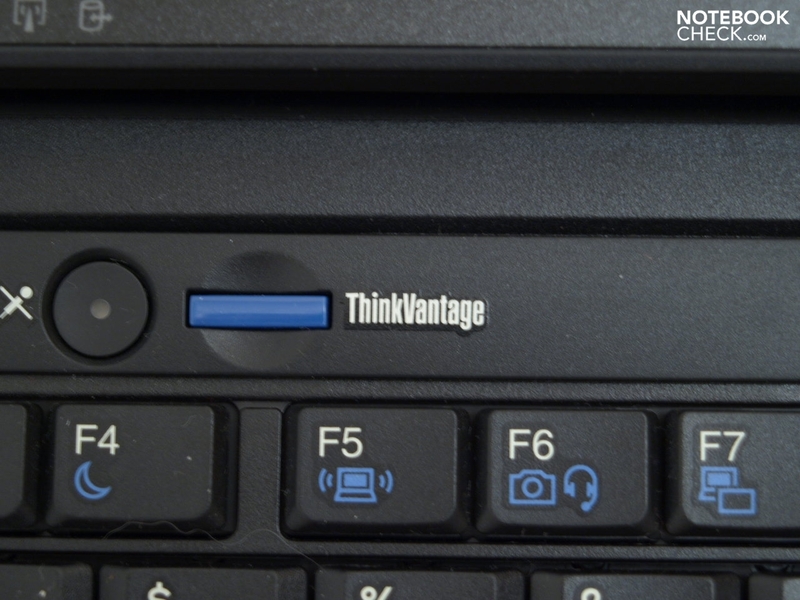 In return there are several comfortable tools under the name ThinkVantage pre-installed, with which it is possible among other things to quickly create system restore DVDs. 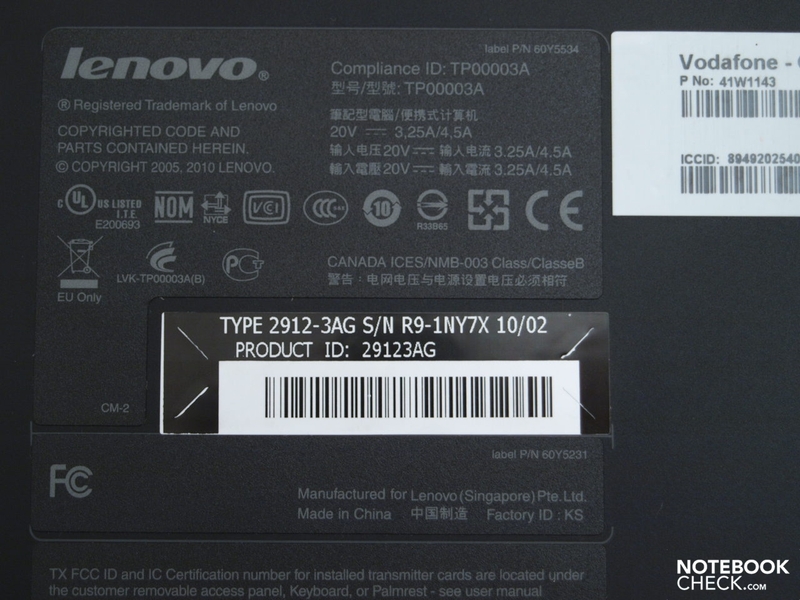 In Europe the user Warranty for Thinkpad T-series devices is the standard 3 years. In contrast in the USA there is only a 1 year warranty free of charge. 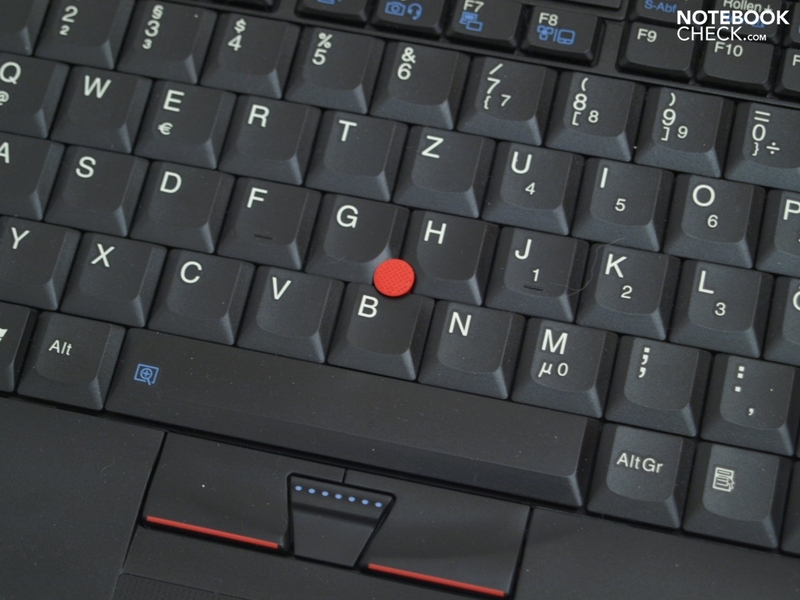 When it comes to the keyboard, touchpad and trackpoint, there is nothing left to add to the description of the T410. All three have typical Thinkpad qualities. 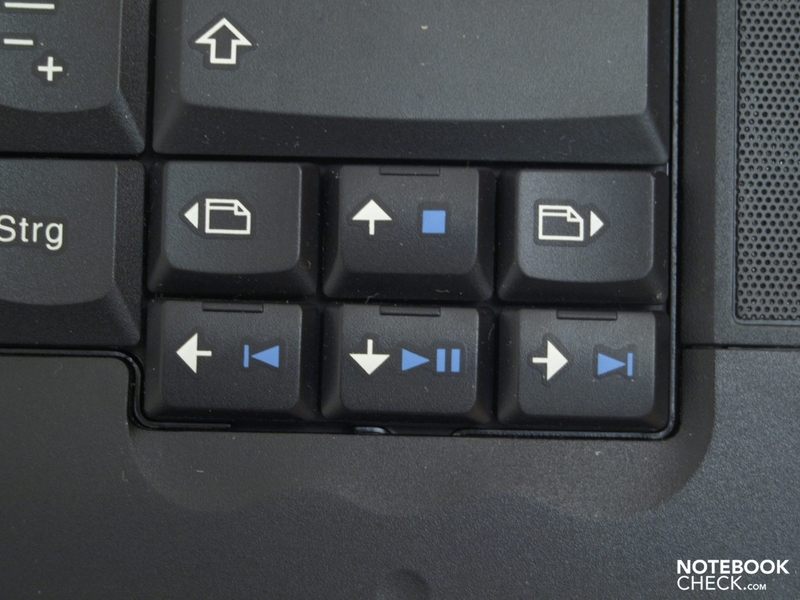 The most annoying thing at the beginning is that the Ctrl and Fn keys have been swapped around. Otherwise the device offers the standard layout with an overseeable key grouping. 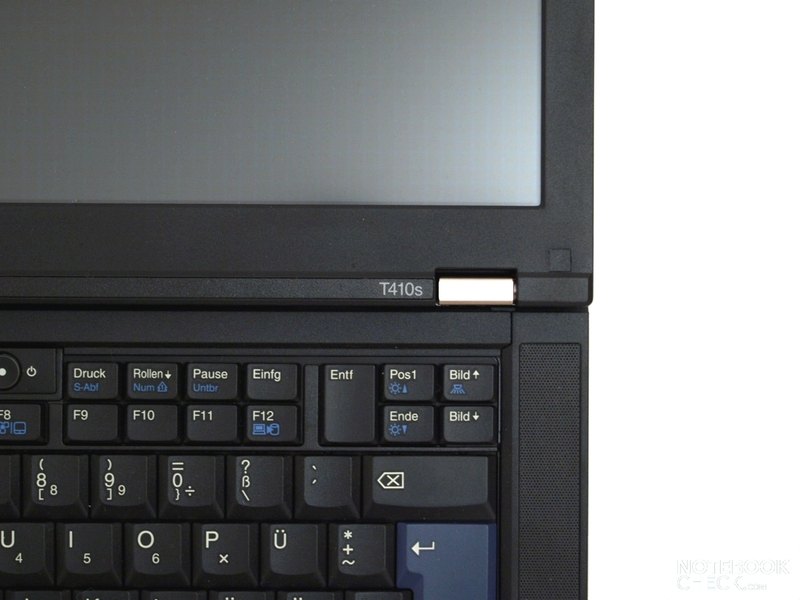 As with the T410, the Esc- and Delete keys are extended in length, and the Insert key has been removed from this group of keys. Haptically the mechanical properties of the keys leave nothing to complain about. The touchpad has a slightly bumpy surface with good friction against fingers. 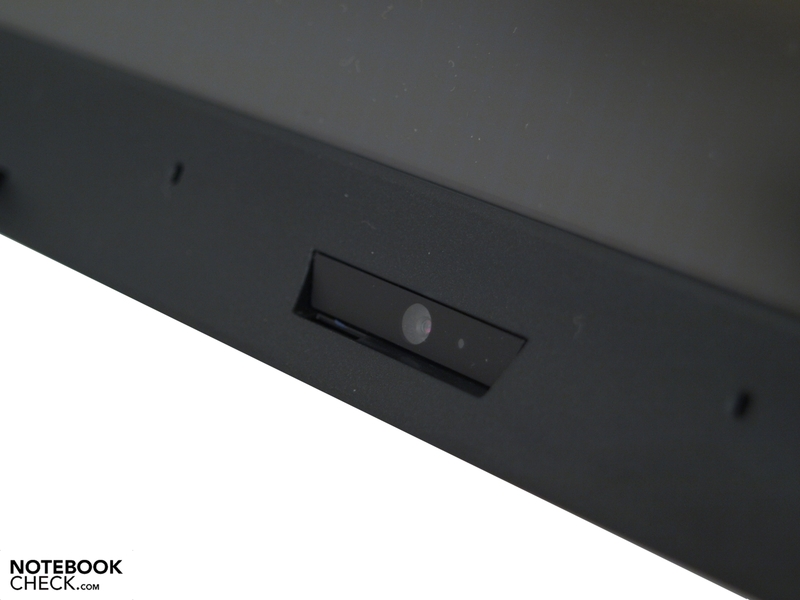 The touchpad buttons are located in the slightly rounded part of the case. They are quiet, easy to operate, but still provide clear feedback. The red trackpoint can convince as usual, since it makes it possible to steer the mouse pointer very accurately with a bit of practice. The accompanying buttons, are once again tilt buttons. They work quietly and respond well. 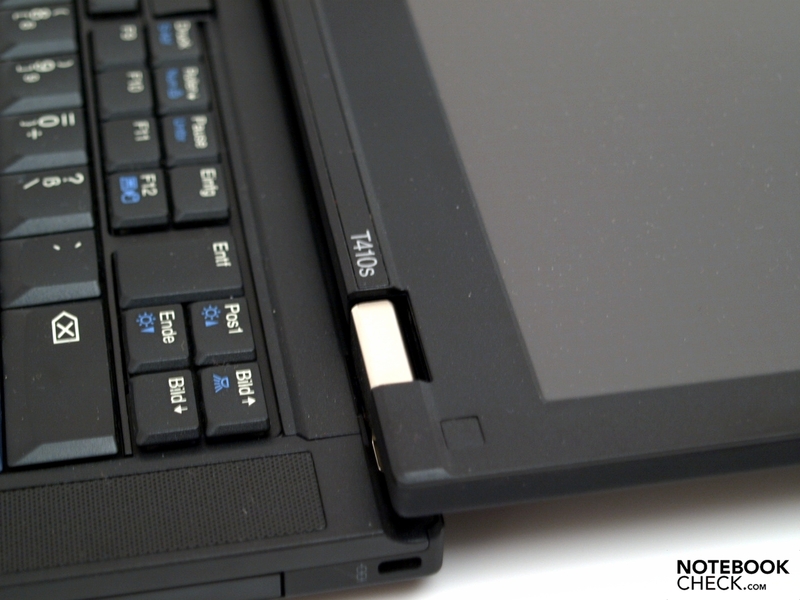 Let's get to the actual special feature of our T410s with respect to input devices. Its display responds to touches with fingers and digital pens. The latter of which is however not included in the accessories, so that all tests had to be carried out using fingers. The control works sufficiently well, as long as the finger covers the selected item properly. Working with a digital pen is likely much more comfortable in this respect, particularly, since the clicked object can still be seen. With multitouch gestures it is for instance also possible to scroll and zoom directly on the screen. Otherwise it is also possible to enter data using handwriting. The handwriting recognition still works quite well despite using finger-entry. On top of this, it is also self-learning so that it will improve over time. As comfortable handwriting entry can be using a digital pen, a practiced typist is likely to be faster typing it in directly. Even more so since it is necessary to check the correct recognition of every word after entry. Included is a 14.1 inch WXGA+ display with LED back lighting by Lenovo with the monitor ID LEN4036, which, as already mentioned, is touch sensitive. 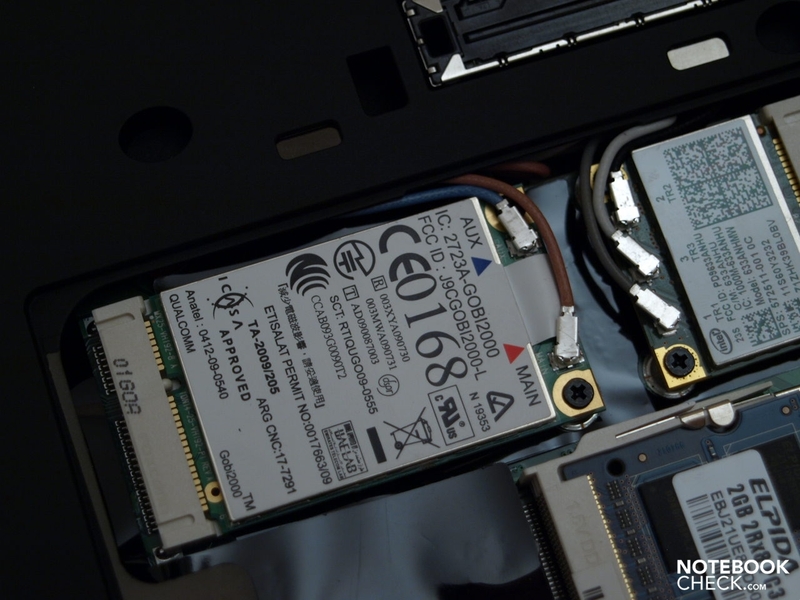 Now we want to focus on the key benchmark details of this device. 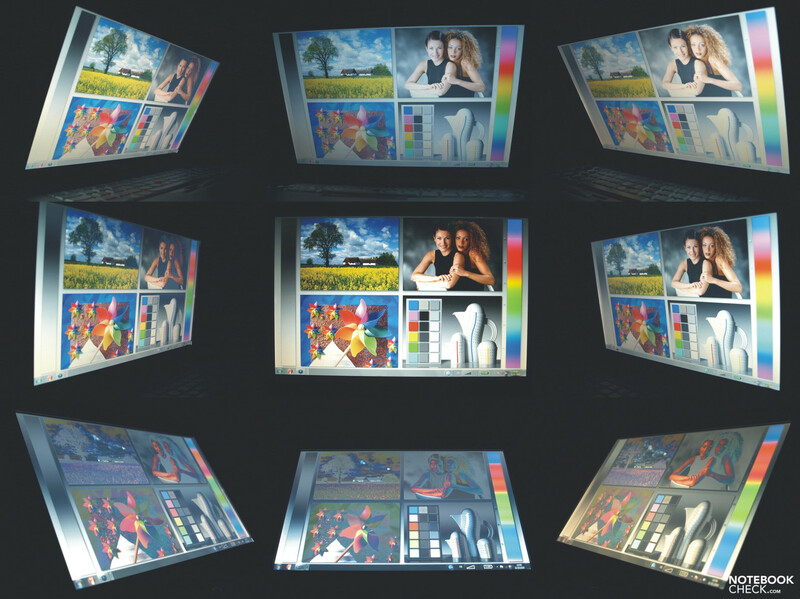 The display offers the same resolution as the previously tested T410, with a total of 1440x900 pixels resolution, and hence a 16:10 aspect ratio format. Typically for a business laptop, only a matte surface came in question. 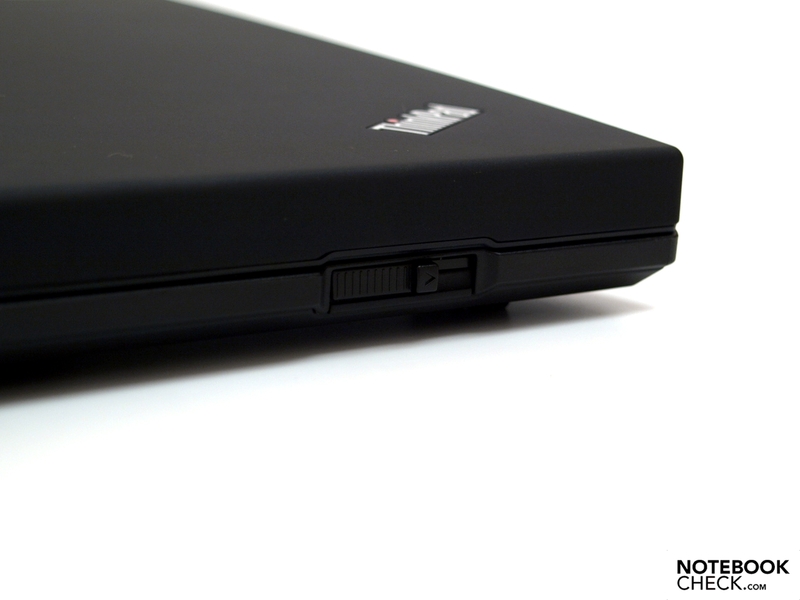 Although the Thinkpad T410s can convince with a very good maximum brightness, it doesn't go much further than that. On average it is still 245.6 cd/m², but in the upper mid area the measured brightness level was only 188.8 cd/m². Thus this results in a below average illumination of only 67%. Even worse is the contrast ratio: 95:1, which is considerably low. The cause is a very high black level at 2.99 cd/m². Its not surprising then that the black looks grayish, and there is significant scope for improving the color saturation. At least writing is clear and without trailing shadows, and the color grading, which is smooth and does not cause visible steps, is also satisfactory. 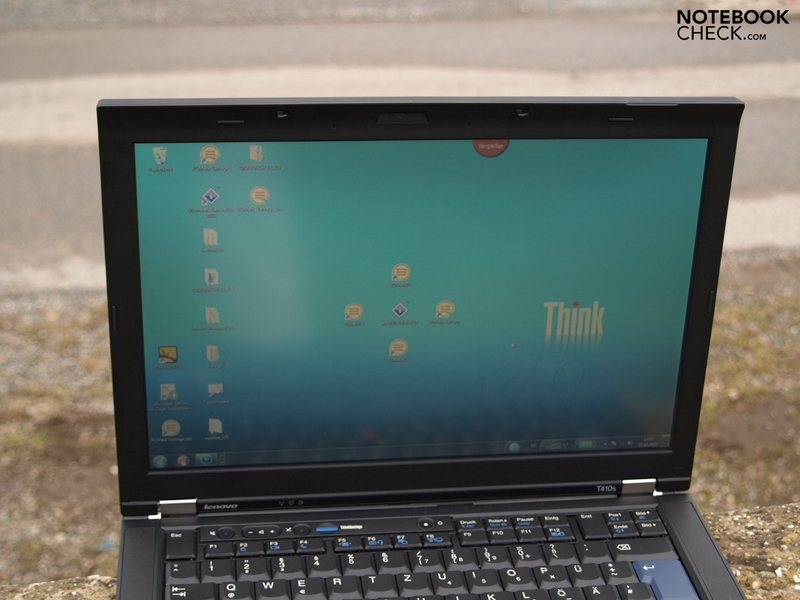 When used outdoors on the other hand, the display on the Lenovo T410s show its strengths. Due to the good brightness level and the matte surface, working in well lit environments and outdoors is not a problem. Although a higher contrast ratio would also provide a welcome improvement here. The useful viewing angles are typical of notebooks. Vertically it quickly comes to noticeable changes of the images as expected. Whereby several people can gather around next to each other, and discuss the latest business budget or watch a DVD together to relax. In comparison to the previously tested reasonably good "normal" WXGA+ T410 display, the multitouch panel can't make up any ground either. On the contrary, for the touch/pen input it is necessary to make further compromises in terms of the brightness and contrast. 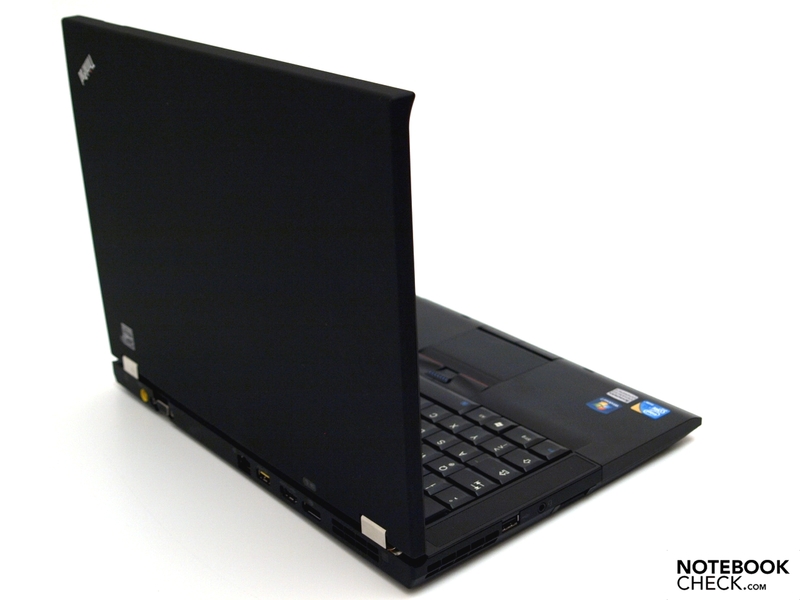 Our tested notebook is based, as all other T410s devices, on the Mobile Intel QS 57 chipset. This means that the maximum amount of RAM is 8 GB. 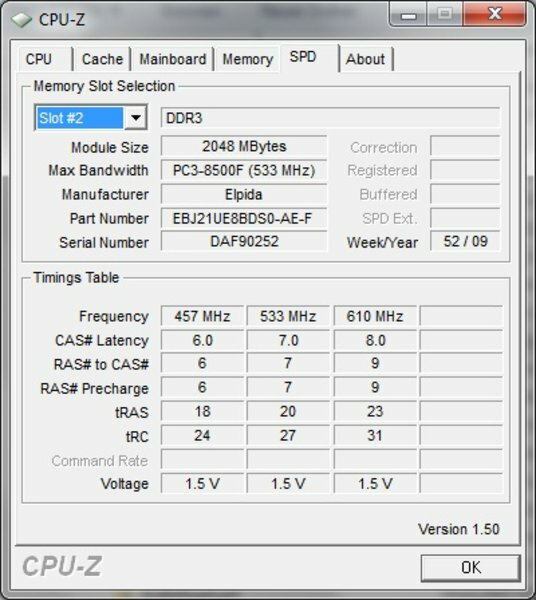 In our tested notebook there were 'only' 4 GB installed, in the form of two 2 GB DDR3 modules. Should a main RAM upgrade be required, then at least one of these modules will become redundant. 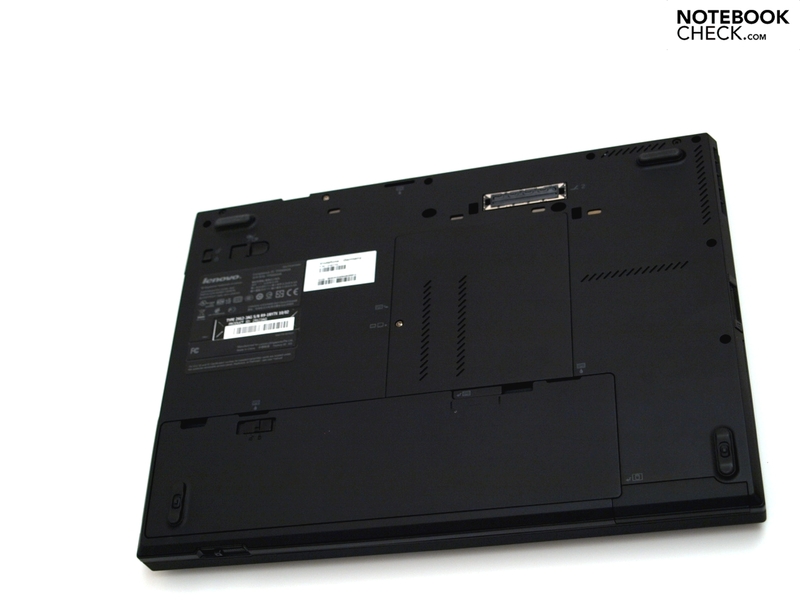 Such a replacement can be easily carried out by a layman via the removable panel on the bottom of the notebook. 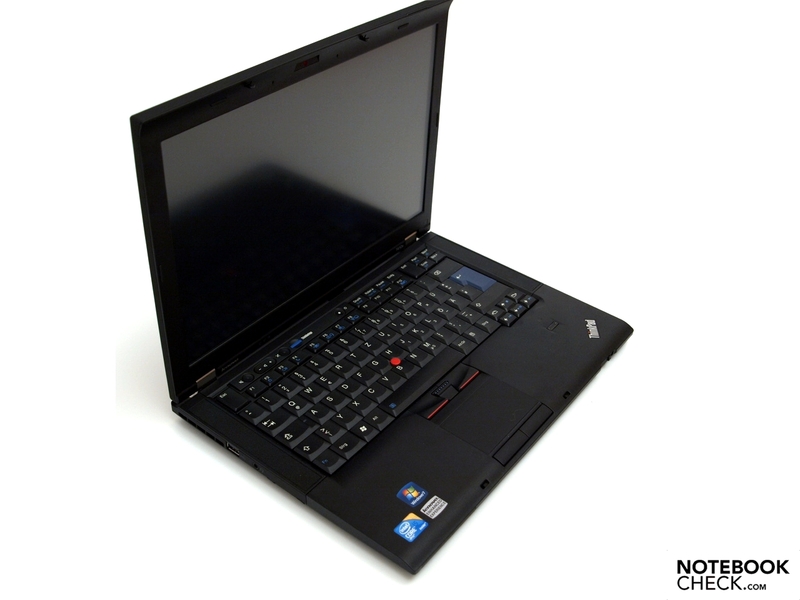 The main board is fitted with an Intel i5 520M processor, and thus one of the slightly weaker CPU options that are offered for the T410s. This is a two core processor manufactured according to the 32nm process. 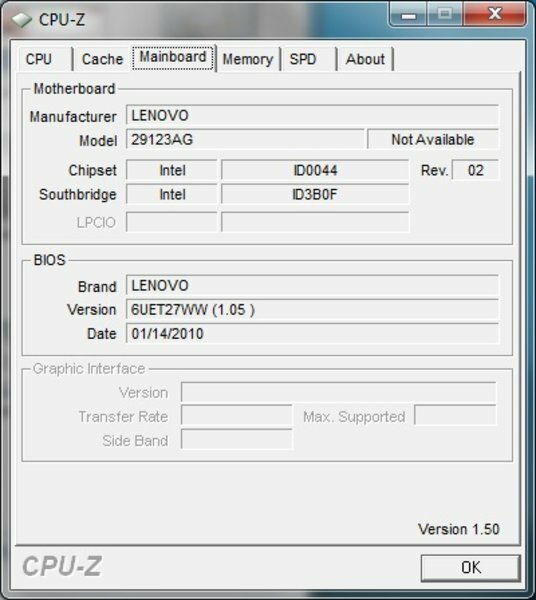 If configuring the T410s in Lenovo's US online shop, buyers will notice that the device is currently however only available with the same i5 520M CPU. Thanks to Hyper-Threading four threads can be processed simultaneously. The Turbo-Boost allows individual cores to be over-clocked according the requirements automatically. Hence a good processing performance can be expected, which is slightly better than Core 2 Duo processors running at the same clock speed. 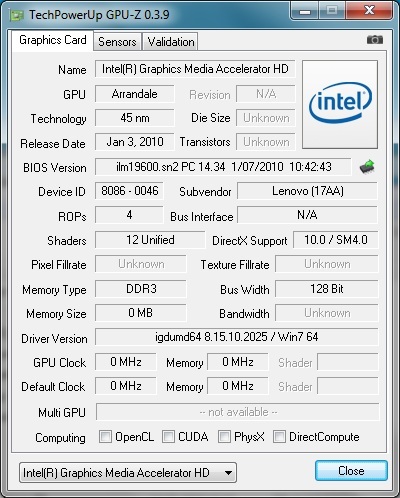 Our tested device only used the processor integrated GMA HD graphics chip. The 3D performance offered by this is not exceptionally good. 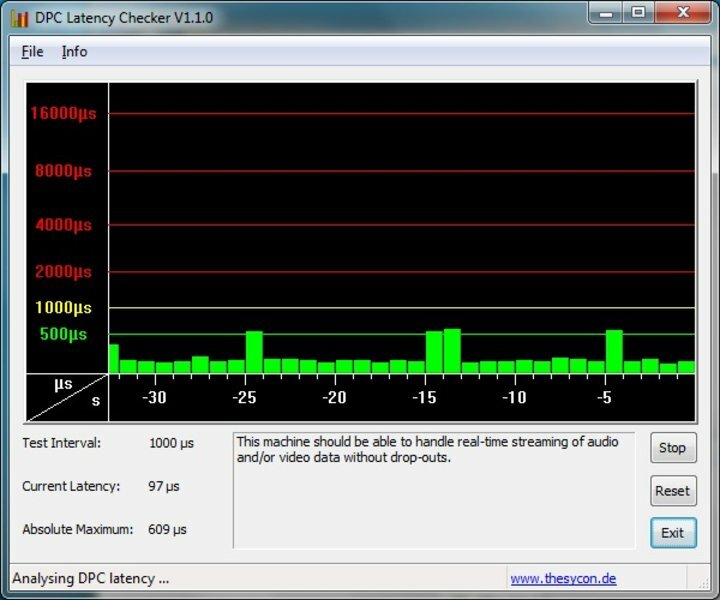 But, least it offers GMA HD hardware acceleration for HD video decoding. To be precise; MPEG-2, VC-1, and AVC are fully supported. The top of the range model from the T410s series in contrast has an Nvidia NVS 3100M graphics card included according to the manufacturer, which allows switching between the two graphics cards according to performance and mobility requirements. In order to assess the application performance we used the PCMark Vantage benchmark in the 64-bit as well as the 32-bit versions. The T410s achieved a total score of 9047 and 8891 points respectively, and thus belongs to the top 3 notebooks we have tested thus far in terms of application performance. 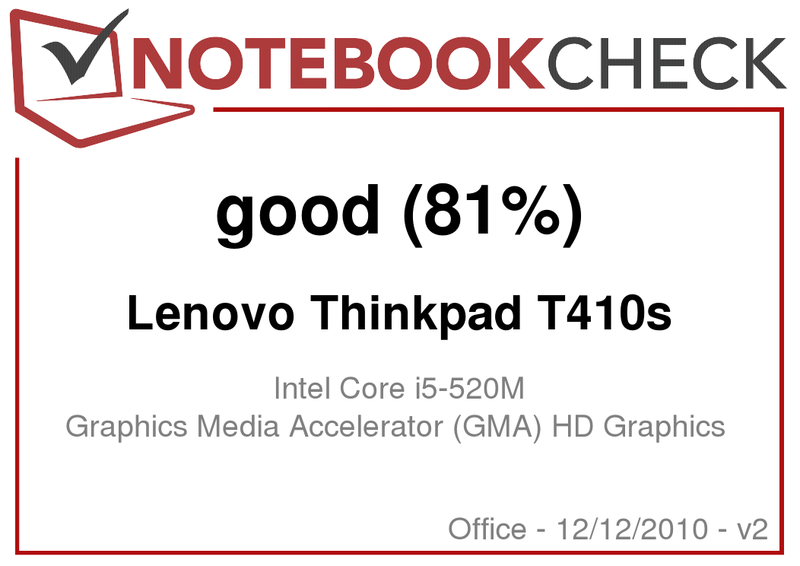 The only notebook that surpassed this score was the Alienware M17x (ATI Mobility Radeon HD 4870 (X2)). 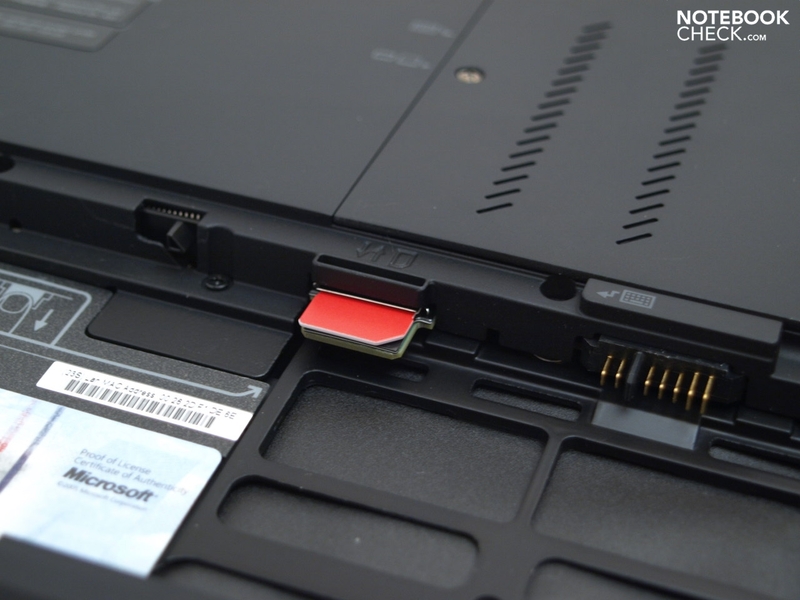 The cause of this is the improved performance due to the use of an SSD instead of the usual rotating disc hard drives. But not only the hard drive score is better than similarly equipped notebooks with rotating disc hard drives at 14167 points. 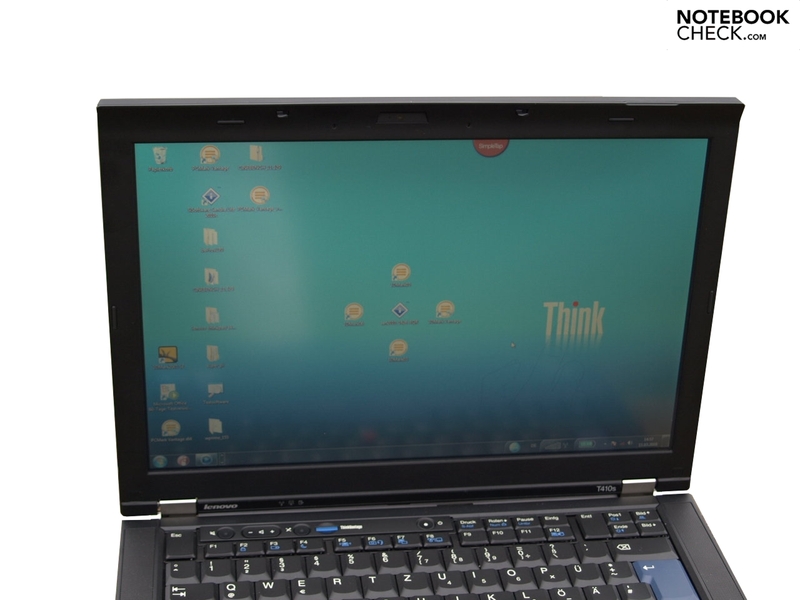 The T410s also achieves good results for communication (9153 points), music (8785 points), and productivity (11567 points). Its a different picture when looking at the processing power and the graphics performance. Lets look at the results of the Cinebench R10 tests next. 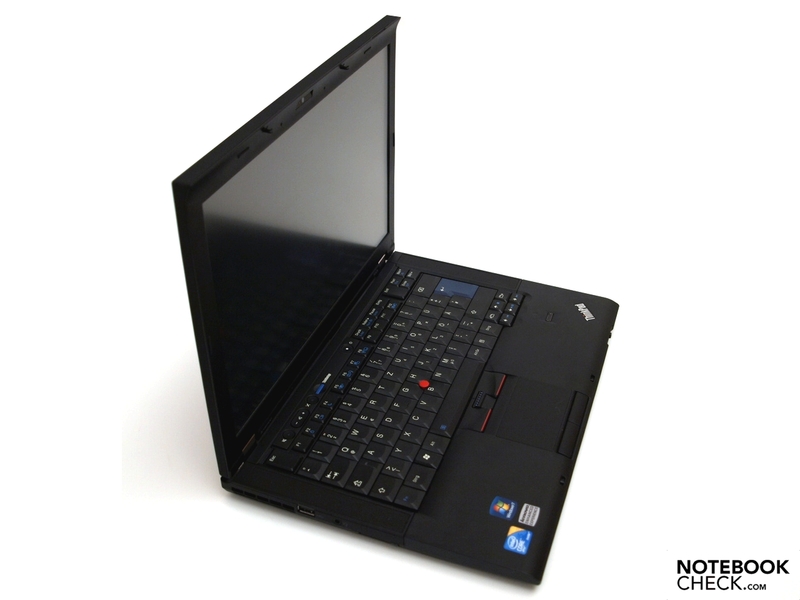 Using single-core-shading the T410s achieves 3815 points in the 64-bit version, and 3056 points in the 32-bit version. Using multi-shading this value is 7882 (64-bit) and 6465 (32-bit) points, and is thus on a par with other i5 520M fitted notebooks, and better than Core 2 Duo notebooks running at the same clock speed. Alone due to the GMA HD graphics chip integrated into the processor, we would expect a not too good 3D graphics performance. 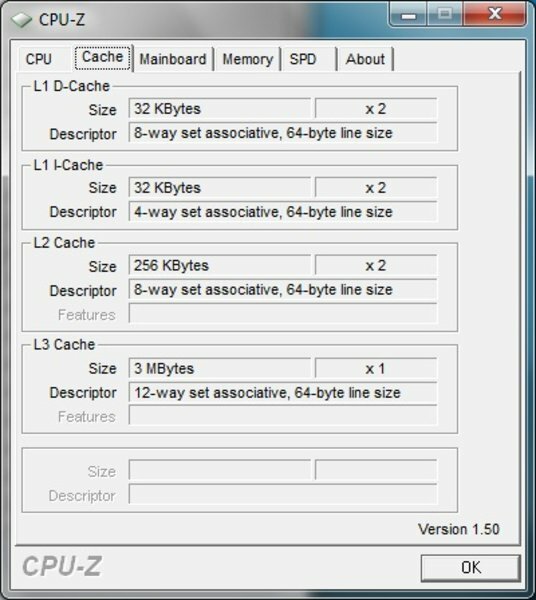 The shading in Cinebench R10 only achieves 1457 points, and lies behind other systems with the same GMA HD graphics chip. Similar results are found using the 3DMark06 test, where the CPU score is clearly appropriate for the processor, but the total score is significantly lower than that of similar devices with the same graphics chip. The same applies to the 3DMark03 and 3DMark05 scored values of 4347 points and 2834 points respectively. A later test then brought significantly better results to light. All the tests were carried out with the profile set to "Maximum Performance". From these results it is obvious that the T410s has relatively big variations in graphics performance. We didn't find any surprises in practice, using two different modern 3D games with spot check type tests. First we performed the CPU and GPU tests in Crysis using low details and 1024x768 pixels resolution, which both led to a refresh rate of 23 FPS. 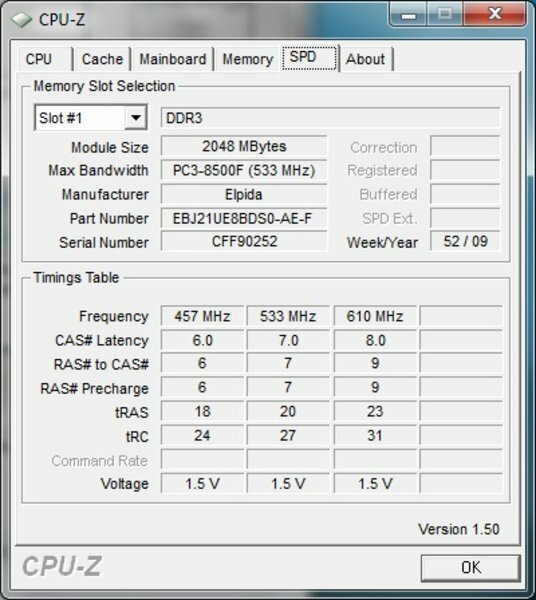 With this result the T410s stays below the playable level for Crysis. The situation is better when it comes to Anno 1404. Using low details and 1024x768 pixels resolution, we established a refresh rate of 30 FPS. The integrated hard drive is a SAMSUNG MMCRE28G8MXP-0VB. 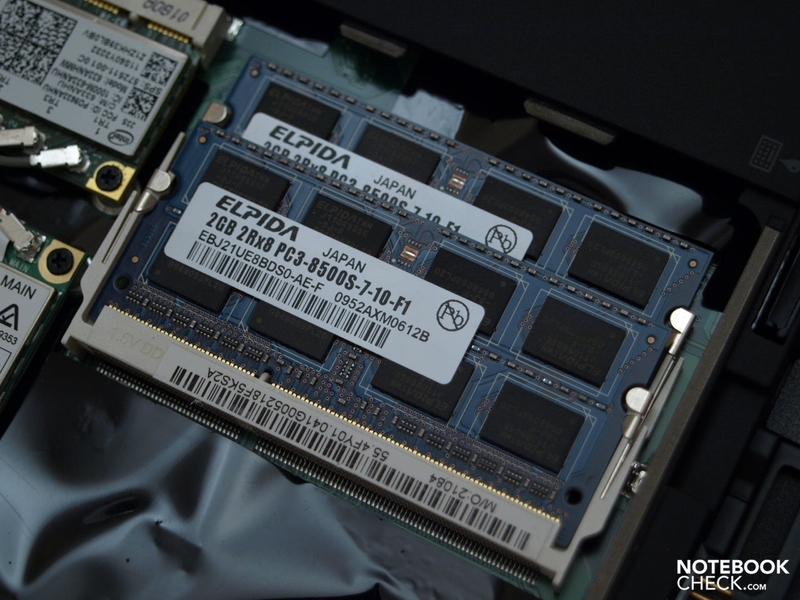 This is an SSD with a total capacity of 128 GB. Technical details can be found on the manufacturer website. Since SSDs do not have any mechanical moving parts, data is safe from loss due to impacts and concussions. With respect to access times and data throughput the SSD is also better compared to usual 7200 RPM rotating disc hard drives. It also works more quietly. One disadvantage is the lower capacity. 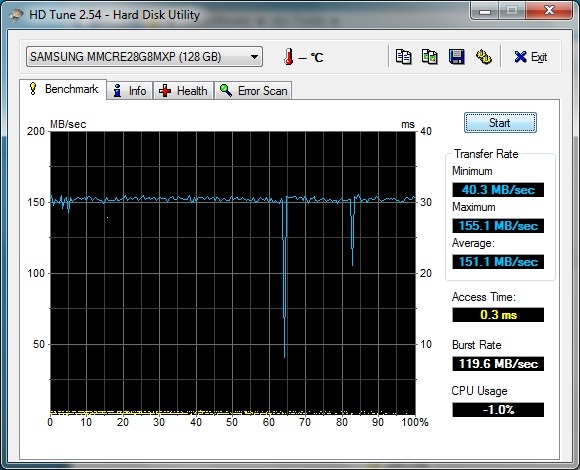 A detailed comparison between HDDs and SSDs can be found in our comparison test. The Ultra-Bay slot contains a DVD-RAM UJ892 drive by Matshita as standard. According to the datasheet there should also be a Blu-Ray option available. In this case buyers will also notice that this option is currently not available in the US online shop. 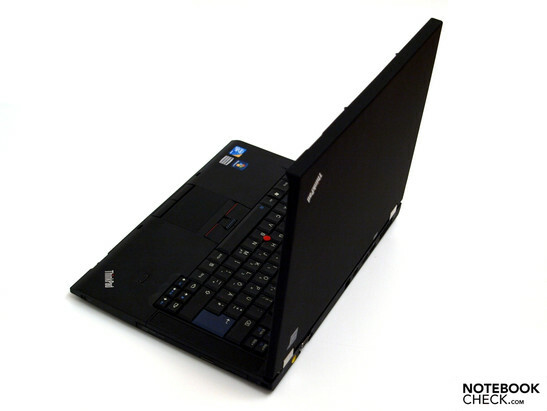 The Thinkpad T410s is a relatively quiet device. The maximum noise level when subjected to a high load is 36.9 dB(A). The minimum is 32 dB(A). Whereby the cooling system runs at a relatively constant level, with a quiet low frequency humming. Alone the DVD drive is noticeably loud and a bit unpleasant when accessing data, emitting a noise level of 44.2 dB(A). A positive aspect to be noted is that the notebook stays pleasantly cool when operating with a low load. We measured a maximum of 31.8 degrees Celsius on the bottom of the notebook under these conditions. 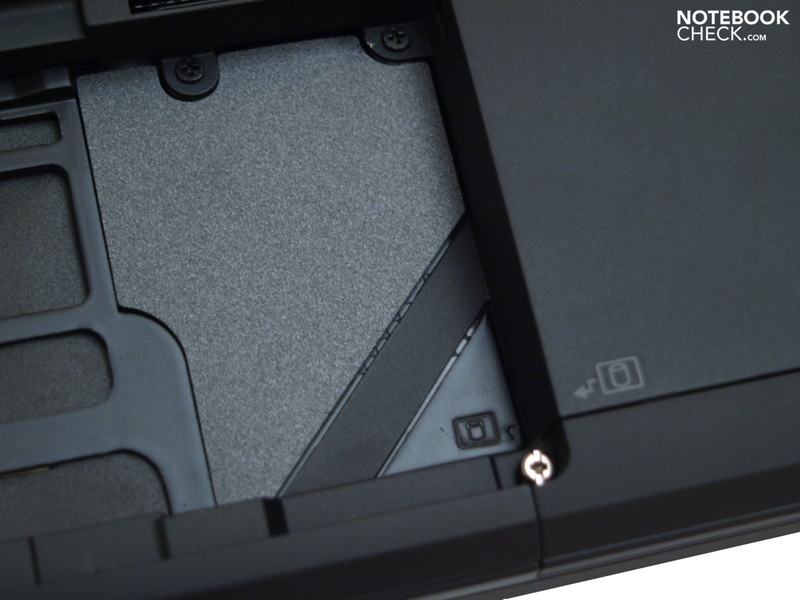 When subjected to a high load, the notebook, partially due to the low height of the base unit, gets relatively warm. Under these conditions we measured maximum temperatures of just over 50 degrees on the bottom. On the top surface the temperature stays within an acceptable level around the hand resting area, touchpad, and the frequently used key area. (±) The average temperature for the upper side under maximal load is 35.6 °C / 96 F, compared to the average of 29.4 °C / 85 F for the devices in the class Office. (±) The maximum temperature on the upper side is 42.4 °C / 108 F, compared to the average of 33.9 °C / 93 F, ranging from 21.2 to 62.5 °C for the class Office. 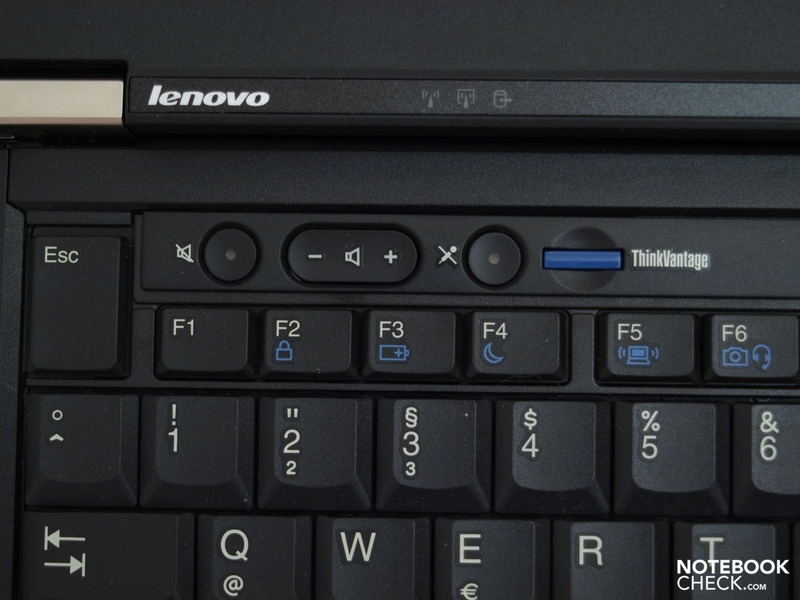 The two stereo loudspeakers are located, as in the T410, on the left and right next to the keyboard. The maximum volume is sufficient for use at work, and the sound does not get distorted. Mid range and high frequencies give a well balanced impression, but the sound has to make due without a sub-woofer and hence lacks bass, similarly to most notebooks. Since this is a business notebook however, the sound quality is unlikely to be a high priority. 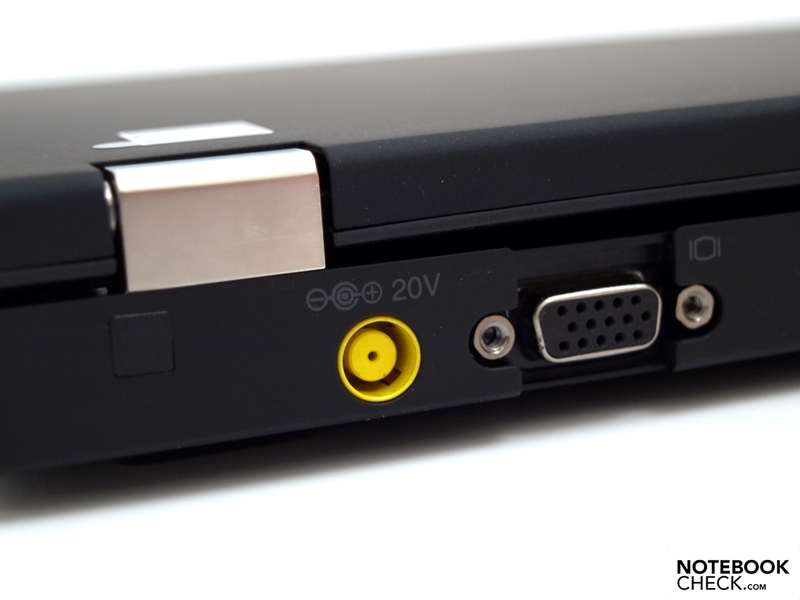 Nevertheless, in order to enjoy music properly, good quality headphones or external loudspeakers should be connected to the 3.5 mm combination audio socket. The 44 Watt-hours capacity (11.1 V; 3.9 Ah) of the included Lithium-Ion battery is not exactly particularly generous. Its not surprising then, that the battery is empty after about 52 minutes when the notebook is operating at full capacity. 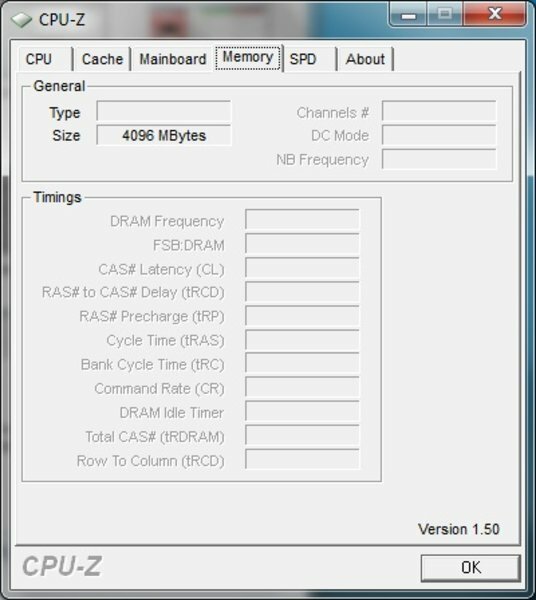 This value was determined using the Classic Test with BatteryEaterTools, with brightness set to maximum, the WiFi modules enabled, and the profile "Maximum Performance" set. The related Reader's Test led to a maximum battery life of about four hours, with minimum brightness, deactivated wireless communications, and the energy saving profile set. Since minimal brightness is definitely not suitable for practical use, it should come as no surprise that the practical tests results deviate significantly from the theoretical maximum battery life. Using the energy saving profile, and a brightness of 13/15, the battery is empty after about two and a half hours of surfing the web using WiFi. The battery life is a little shorter, more specifically only about one and a half hours, when watching a DVD movie, the average Hollywood movie with a length of roughly 90 minutes is just about watchable. 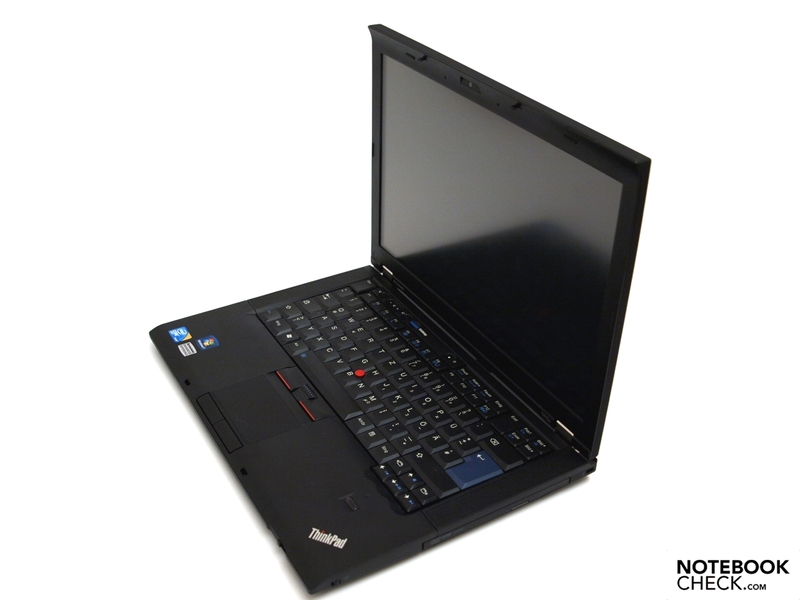 The power consumption of the T410s is altogether in the acceptable range taking into consideration its components. In Idle mode the power consumption varies between 11.4 and 18.1 Watts. As soon as the applications get more demanding, this value increases to about 43.6 Watts. At full capacity of the graphics card and CPU, using Furmark and Prime95 simultaneously, this reaches a maximum level of 55.2 Watts. The LED display, as well as the graphics chip integrated into the processor, and the capability of the CPU to reduce its clock speed, all contribute towards energy saving. The T410s with the tested components stands out amongst the mass of business notebooks for office use, primarily due to the integrated SSD and the touchscreen. With the Core i5 520M CPU and the four Gigabytes of RAM, in combination with the 64-bit operating system, a very good application performance is achieved, mainly thanks to the processor. The graphics performance stays within the usable domain with the integrated GMA HD chip. Although using 3D demanding applications is probably better left alone. 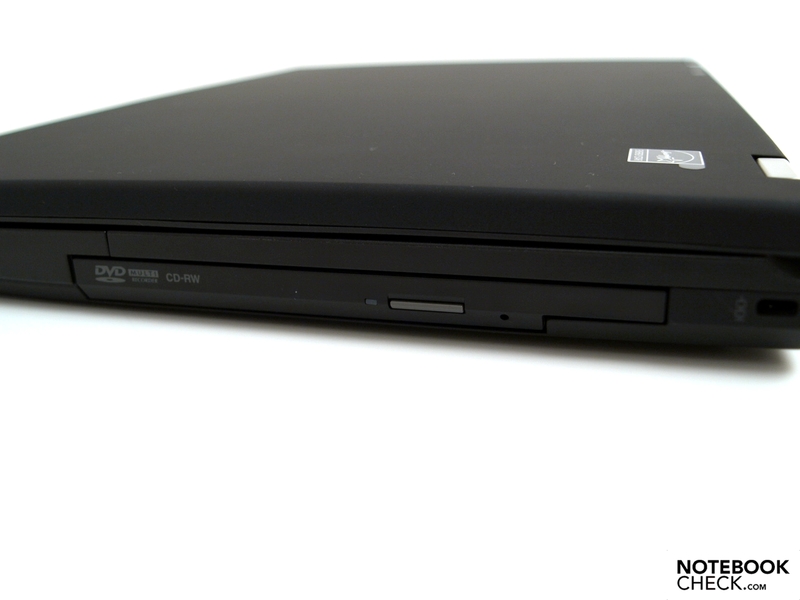 For better graphics performance a notebook with the Nvidia NVS 3100M could be considered. 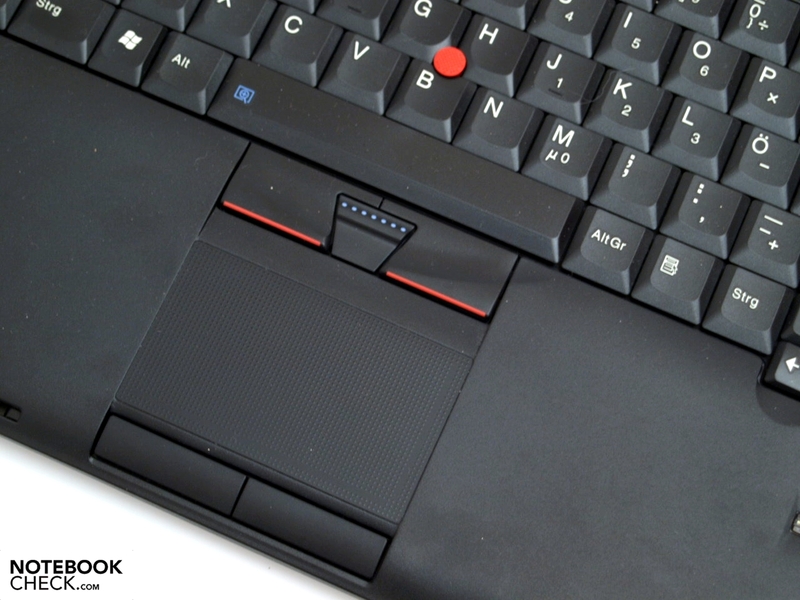 Judging by the exterior, the T410s is definitely a typical up-to-date Thinkpad. Just like its relatives, it scores with very good entry devices and thought through communication features. Since there is no digital pen included, the touchscreen failed to convince completely. The display has a good brightness level, is however unevenly illuminated, and only has a low contrast ratio. For every day office use the color representation is sufficient. Thanks to the matte surface, it is definitely appropriate for daily business use and when traveling. The T410s provides a good companion for office use, that is well suited for business trips thanks to its 14.1 inch size and light weight. Assuming the relevant communication infrastructure is in place, then many communication options are available, although there is no RJ-11 modem connection. Using a docking port, it is also possible to easily integrate it into existing work environments. The hard drive is not so easy to reach. The extremely good application performance, to which the SSD contributes significantly, and the relatively good and comprehensive communications features. An included digital pen for the touchscreen. Why Lenovo is so economical with accessories at this price. 14 inch business notebook with touchscreen.